Children’s National Health System was among the first in the country to offer a spinal growing rod for children with scoliosis. The MAGEC™ (MAGnetic Expansion Control) Spinal Growing Rod is a non-invasive treatment for children with early onset scoliosis. After the initial procedure to implant the rod, doctors use an external remote control outside of the body to lengthen the magnetically controlled rod as a child grows. 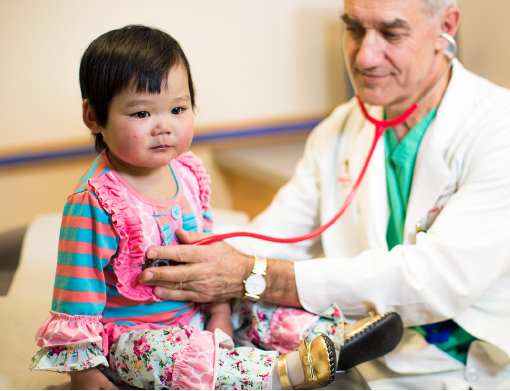 At Children’s National, we perform follow-up care in the office. It’s non-invasive, making the adjustments easier for patients during their course of treatment, because they need fewer surgeries. Growing rods have become effective tools for children whose spinal curvature is too significant to control with bracing or casting. The rods—which are surgically attached to the spine above and below the curve and then lengthened during follow-up surgical procedures—allow the spine to continue growing while managing the curve until the child is old enough for spinal fusion. “Traditional growing rods work, but they require multiple surgeries that increase complication rates and time spent in the hospital,” said Matthew Oetgen, MD, Interim Division Chief of Orthopaedic Surgery and Sports Medicine and Director of Orthopaedic Research at Children’s National. “We treat many children each year who have or are candidates for growing rods, so it’s important for us to embrace new technology to make the lengthening process easier and less painful for children while decreasing morbidity.” Dr. Oetgen and his colleagues believe they’ve found just such a technology in the MAGEC Spinal Bracing and Distraction System by Ellipse Technologies, Inc.
Like traditional growing rods, MAGEC is a means, not an end—the system provides a bridge treatment spanning the years between the initial lengthening surgery and spinal fusion. MAGEC Growing rods can correct or control severe curvatures of the spine. Traditional treatment uses rods that require surgeries about twice a year to manually lengthen the rod while a child is still growing. With the growing rod, the rod is magnetically controlled with the external remote control, so our orthopaedic surgeons can lengthen the rod in a non-invasive way during a child’s course of treatment. Our orthopaedic surgeons lengthen the rod every three to four months in the office using the electronic remote control. The procedure takes only a few minutes. We monitor the scoliosis and treatment progress with radiographs. The benefits include fewer surgeries, less time for the procedure, and less pain. Who May Be Eligible for the Growing Rod? The MAGEC rod is approved for children with scoliosis greater than 50 degrees in magnitude and under 10 years of age. Following MAGEC’s approval by the U.S. Food and Drug Administration in February 2014, surgeons at Children’s National performed two of the first 15 MAGEC implantations in the country, and the first in the greater Washington, D.C., area. Our physicians continue to use this groundbreaking treatment option with children who experience early onset scoliosis. For more information, call 202-476-2112. For more than 25 years, the Skeletal Dysplasia Clinic has provided multidisciplinary care for infants, children, and young adults with various forms of skeletal disorders. Our orthopaedic experts provide minimally invasive orthopaedic surgery that protects children's growth and development. Sports injuries are caused by minor trauma involving muscles, ligaments, and/or tendons, including contusions, sprains, and strains.